My father had trained hunting dogs when I grew up, so I thought I had a few tricks up my sleeve to deal with Poppy’s separation anxiety. The adoption agency recommended to keep her in a kennel since that’s what she is used to. Since not leaving my house was not an option, I outfitted an oversized dog kennel with comfy cushions, water and food and coaxed her in several times a day for an hour or so, staying with her the entire time. No problem so far. It’s recommended to leave only for a few minutes at first, extending the time longer and longer over a couple of days. But as she was perfectly happy with me sitting by her kennel, she didn’t take kindly to me leaving and soon the battle of the wills began. First it was just pacing and whimpering. Then the howling began. Ever heard a greyhound howl? It’s ear piercing and heart breaking and in the long run will bring the police to your front door since your neighbors within the next 2 blocks might think you are running a torture program in your basement. I spend extended time sitting out on my doorstep explaining to concerned passersby that there is no reason to call the authorities, hoping for that ‘aha’ moment when Poppyseed would realize the pretty good deal she got hooking up with me. But instead she started biting the kennel wire until her mouth bled. That was when I noticed there was something wrong with her front teeth. She must have done this before and had worn her teeth to a stubble gnawing on her cage. A light bulb went off – she hated her kennel! She probably had always hated her kennel. I decided to let her roam the house. My fears that she would destroy everything in it didn’t materialize, but the howling continued as soon as I was out of sight. The nice thing about greyhound adoption outfits is that they really know the breed and are willing to work with you, so all kinds of suggestions started pouring in. So imagine you are a racing machine with a high dollar value, have never been cuddled or given a treat nor played with a toy (what’s a toy? ), have been kept in a kennel with the constant company of other dogs, never been alone, never slept inside a house (with stairs (??) no less), and know exactly what happens the next minute, hour, day, week, month…..for the first 4 years of your life! And now there is this human who offers none of that predictability (good or bad) and expects you to be…ahem…a dog, without giving you the definition of what that means! Your life gone overnight! No other dog to model yourself on other than a senile 18 year old furry little thing that looks more like the bunny lure you used to chase than a distant cousin of yourself. At least this human is giving you food although not the yummy meat from the track but – oh I don’t know – Kibbles? And walks are nice, but on a LEASH? And where is the track? And if this friendly enough human goes away too, what are you going to do then??? So there she is, this racing machine with a one track mind (pun intended), thrown in with me and my utterly unpredictable and unscheduled life. Yup…I would be anxious too. No wonder she’s holding on to me for dear life. Which in all practicality means I can not leave my house! Think about it…I can NOT leave my house…. Welcome to my Blog! Check out the different categories and enjoy many fun stories about dogs and see examples of my pet portraits. Although I had heard the phrase ‘greyhounds are different’ I was not prepared for what should happen. How different could she be? Every dog is different, but still as a whole, a dog is a dog –right? OK, so greyhounds supposedly don’t know how to climb stairs, don’t know what to do with toys, have never seen a mirror, are unaccustomed to be a family pet, have never been alone in their lives. On the tracks they live with hundreds of other greyhounds side by side in kennels. They are accustomed to a routine that is the same every day: up at dawn, relief themselves, food, training, relief, food, training …. and in-between endless hours in tight kennels sleeping in the midst of the chaos of a bustling race track. I thought I was well prepared, having internalized countless books on the breed and prep talks from the rescue. “Be patient, she’ll stick to you like glue for a couple of weeks; keep her in a kennel at first, that’s what she is used to, keep a routine, stay with her as much as possible. Watch her with the cat and your little dog”. Sounded like any other dog I ever picked up from the pound. What I wasn’t prepared for was HER utter unpreparedness. She was like a fish out of water, literally. And so was I.
Donna was her racing name, as in Prima Donna. 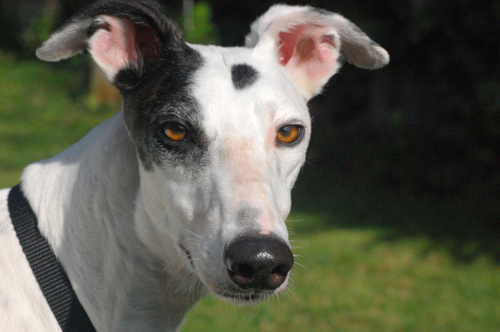 Back then I thought that was a weird name for a dog, but back then I didn’t know anything about greyhounds even though I had been around other dogs as long as I remember. 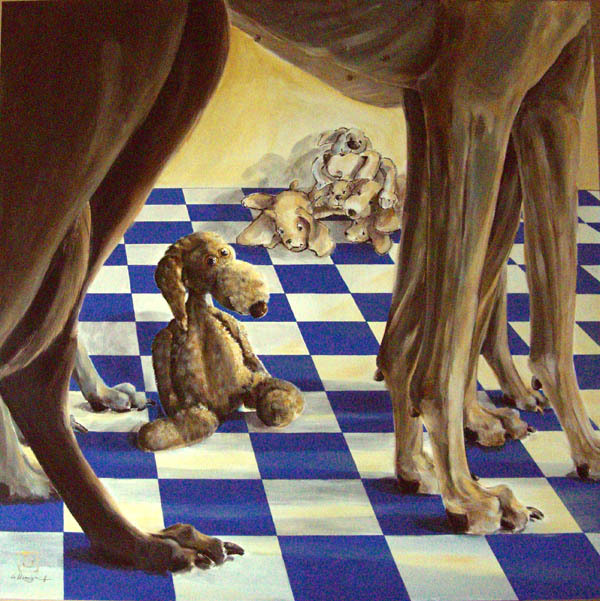 I don’t remember when I first noticed greyhounds but a few years ago three of them appeared in one of my paintings. Or rather their legs did. 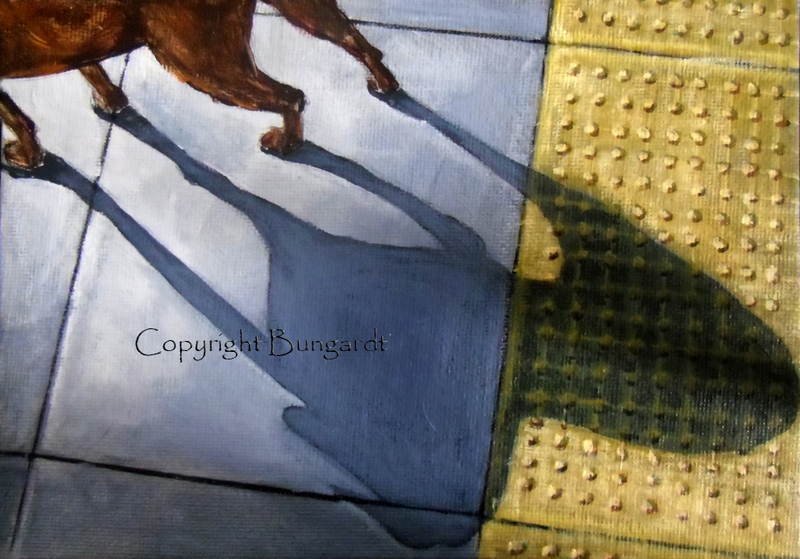 I needed some tall legs for a painting in my –toys and dogs- series so I paid more attention to the anatomy of different breeds and stumbled onto the somewhat grotesque physique of the canine racer’s ‘turkey leg’. Muscle packed and over sized at one end to bare bones and stick like at the other. Now that was the perfect model. Pretty soon I was painting the rest of their bodies, fascinated by how, even in the last details, these dogs are build for minimum wind resistance and maximum speed. The eyes were what hooked me. Huge and perfectly almond shaped, deep amber in color, there was an expressiveness in them not often seen in other dogs. 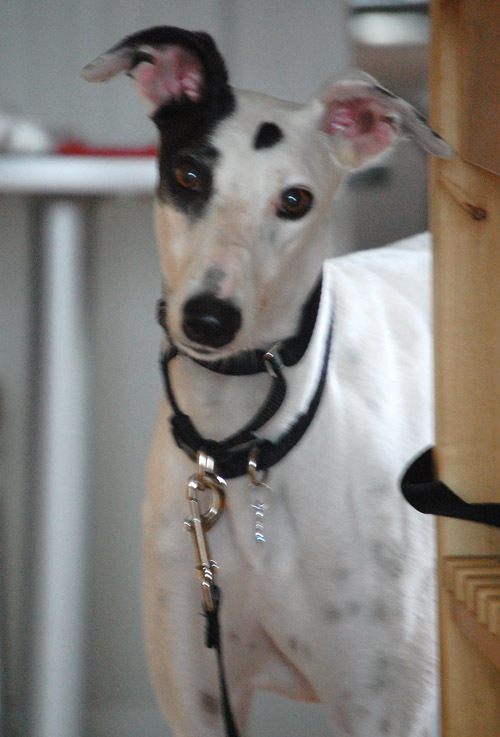 Of course one can’t get interested in greyhounds and not hear about the controversies around the race tracks. 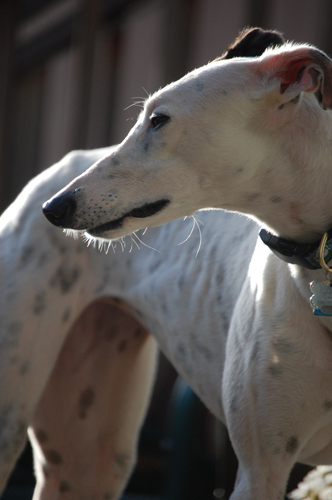 Greyhounds, once discarded from the track as losers, face death. Nowadays rescues around the country find homes for many of them but a lot of them still get killed. There are about 10 race tracks left around the country, mostly in Texas and Florida. Soon I was in touch with a local rescue. My little dog Kruemel had just turned 18 and her days were slow and surely numbered. I could handle another dog, even a big one. My research showed that greyhounds are calm dogs overall with only short bursts of energy, otherwise couch potatoes, affectionate and mellow with a cat like personality. Even though much of this turned out to be true I was not prepared for what it would take to get there. It took a while to find the right dog because it needed to be matched for cat and small dog compatibility, since track dogs are trained on life bunnies and furry lures and greyhounds have a long history as hunting dogs. And so one day, there she was, beautiful Donna. Coming from the Arizona race track she was the pup of successful racing champions with a history as far back as the 1800’s starting in England then Australia and eventually coming to the US. Discarded after only 6 test races because she didn’t win, she showed up at the rescue at 4 years old. Snow white, with a wild sprinkle of black spots like poppy seeds (which gave her her off-track name) she was a dog painters dream. A black ‘eye patch’ and one larger spot on her forehead made her face unique and gave a glow to her amber eyes. A glow that was only there in color not in spirit as I found out soon enough.